Our product range includes a wide range of gass smoking pipe, glass scorpio pipes 5 inches collectible glass pipe and glass pipe sherlock octopus design 5 inches smoking pipe. A Scorpio design glass pipe is a band with honeycomb at the bottom or on its stem. 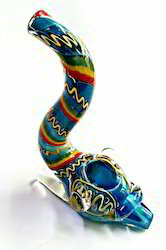 The unique design Scorpio pipes beautifully designed by Newzenx craftsmanship name come from a famous fictional Newzenx in India, who used to smoke a similarly fashioned vintage smoking pipe for your high personality.…if you need custom pieces we can be designed it beautifully with our workmanship, crafted to inspire of the products. This Sherlock pipe is a glass pipe with U Curve at the bottom or on its stem. The Octopus design unique Sherlock pipes beautifully designed by Newzenx craftsmanship name come from a famous fictional Newzenx real artistic manufacturer in India, who used to smoke a similarly fashioned vintage smoking pipe for your high personality.…if you need custom pieces we can be designed it beautifully with our workmanship, crafted to inspire of the products.